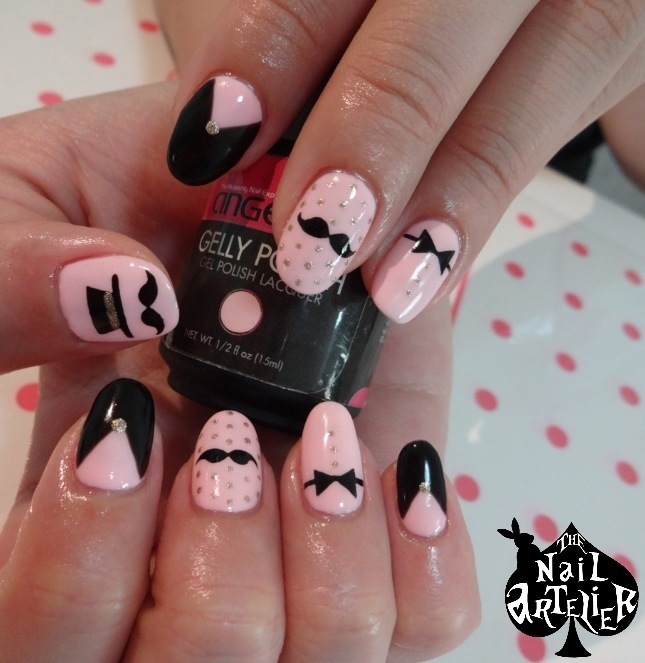 I have a feeling today’s featured design will be pretty popular because… The moustache designs seem to be all the rage. They were popular a few months ago and we still get requests coming in for them, and this particular one is interesting because it’s also very feminine! This design was actually a mix of various designs as requested by the customer, who knew exactly what she wanted. So, my job was made easy and I managed to complete this design very quickly. Super! Hello! 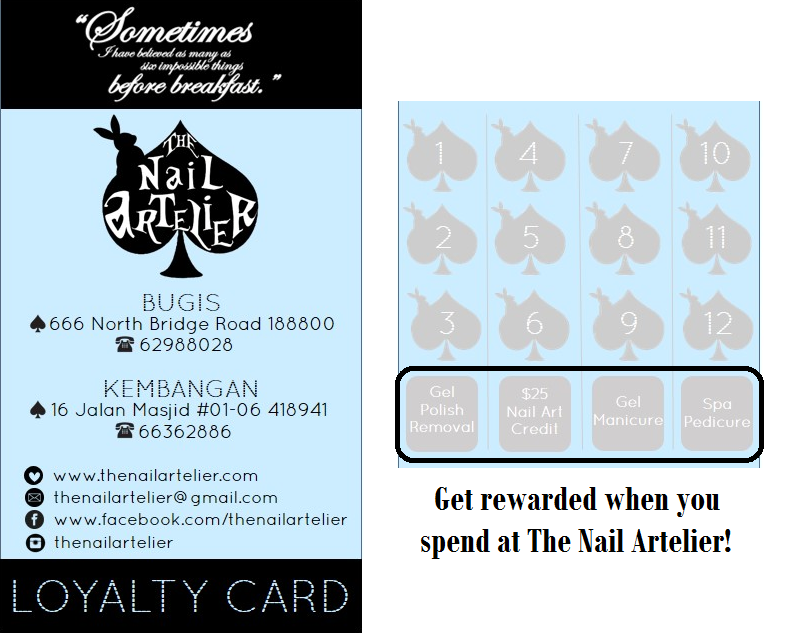 Today I’m gonna share about my first set of bridal nails done at The Nail Artelier! 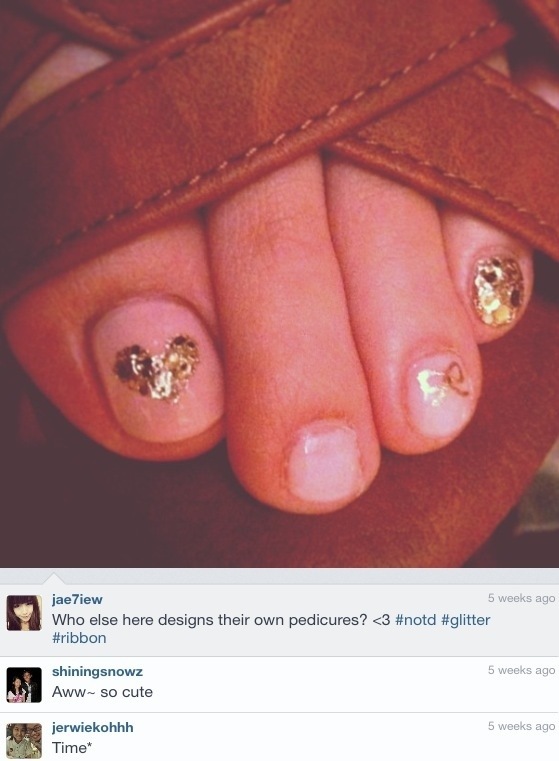 It’s a simple French tip with random opalescent flakes, then blinged out along the smile line! As for the ring finger, there’s an embossed flower in white with some rhinestones too. How have you guys been with the crazed out weather? Do remember to drink lots of water during this period! 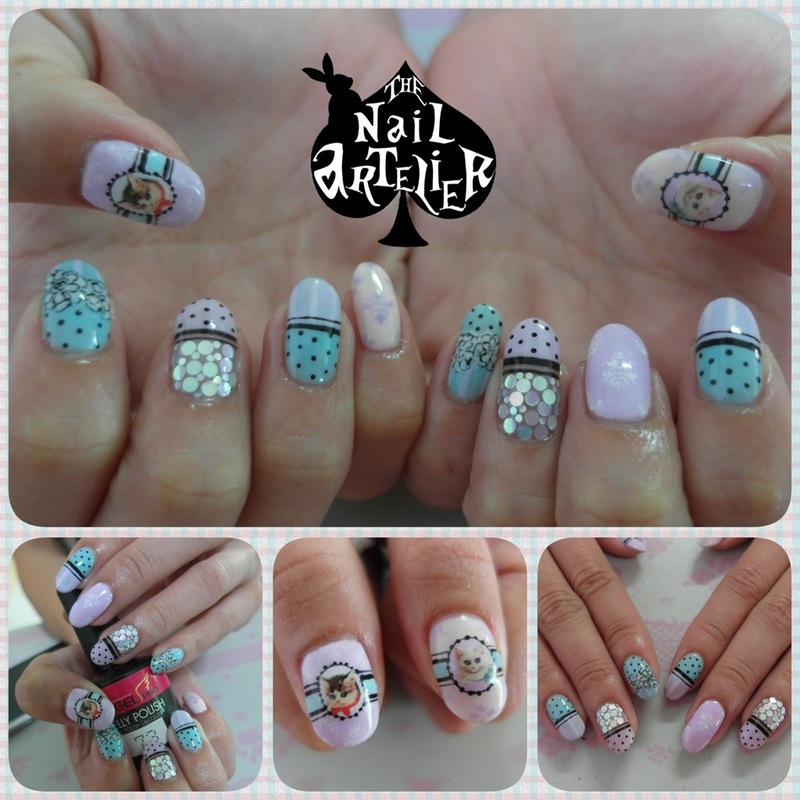 Anyway, I have a personal favorite set of nail art to share for today! 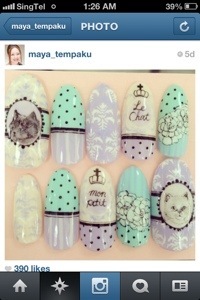 It is a set taken from the very talented Maya_Tempaku from Instagram that you may remember? The original set has hand-drawn cats on both thumbs, but I suggested for stickers for the really realistic cats instead. The customer wanted discoballs to make it more “blinged” out for the whole look. It ended up looking different from the original set, but still pretty nonetheless! I used AngelPro colors for the whole set, except for the black! It’s this wonder pot of black gel that Ying managed to source from her last Japan trip! Super awesome for fine opaque lines like that! Hope you enjoyed this set as much as I did! Till the next! I must confess… I had no idea I was painting Gloomy Bear when I did the design. I know, I know… I was living under a rock. 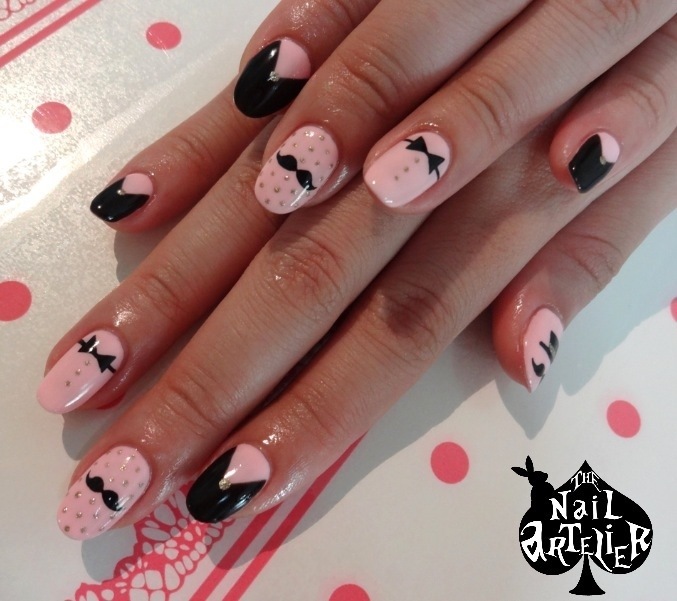 Luckily, this wasn’t technically a customisation request as the customer showed me a picture of some nail designs based on Gloomy Bear and she did a simple mix and match. So, I didn’t need to do any research on Gloomy Bear or come up with ideas for a nail design! It’s disturbing and yet… sort of cute at the same time. Oh dear. 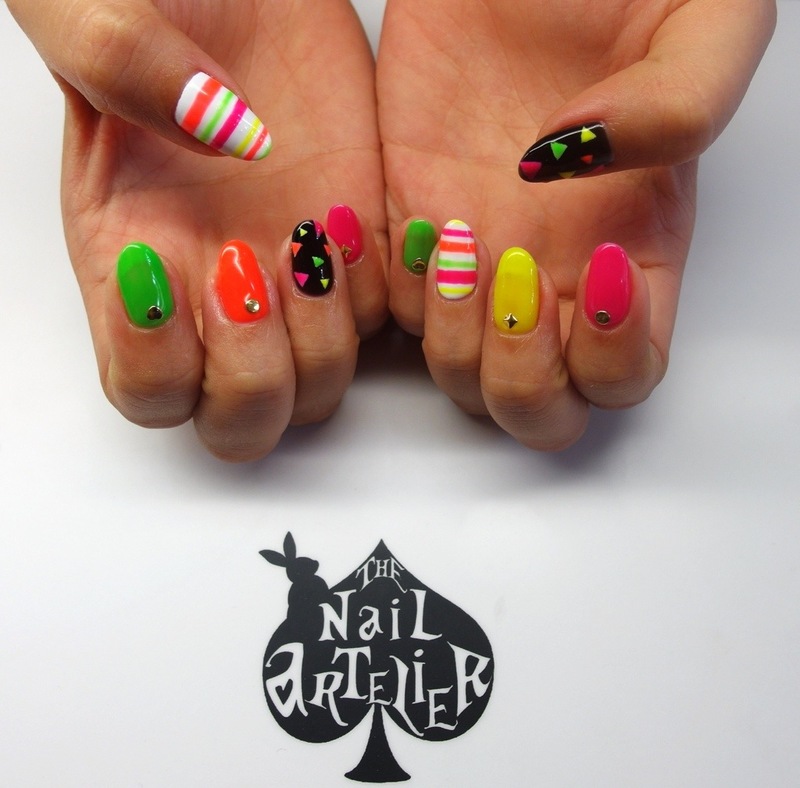 Gel mani: Neon stripes and shapes! 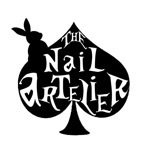 If you have been following us on either Instagram (@thenailartelier) or Facebook Page (www.facebook.com/thenailartelier), you may have seen these designs before! 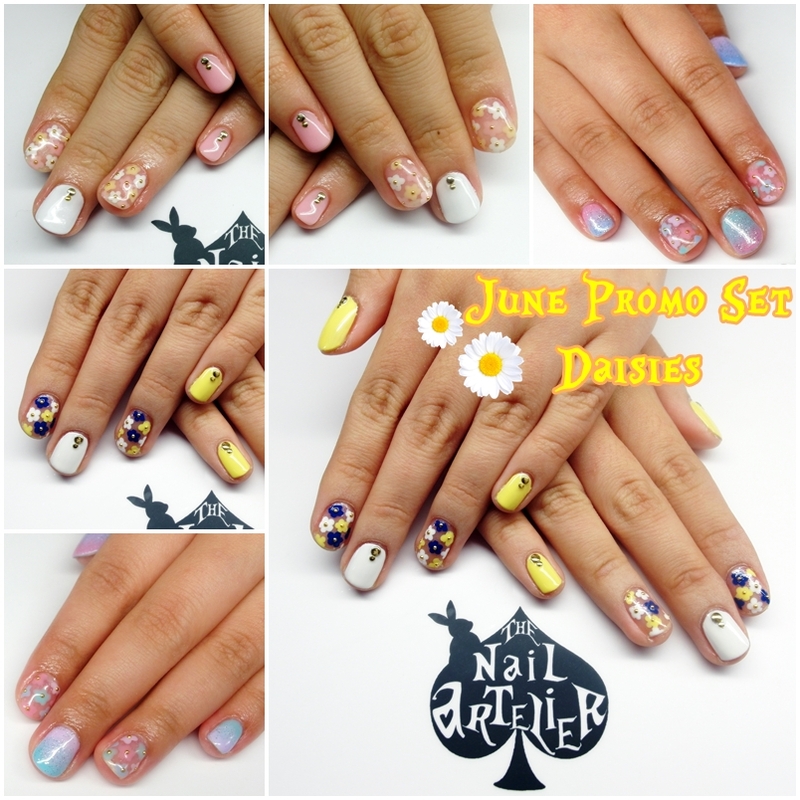 Every month, we will launch about 4-5 sets of designs that are worth about $40 nail art value, and promote them at $25/set on top of the basic services. 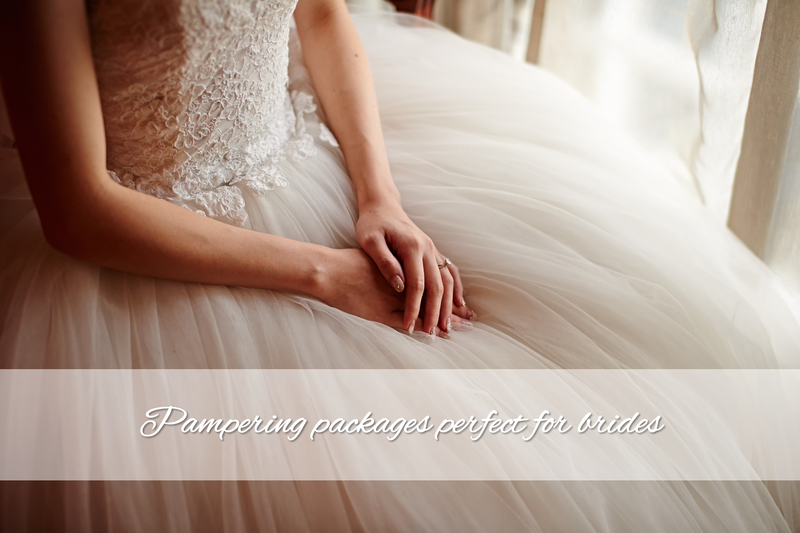 We usually try to have a range of designs to cater to everyone, so there’s no need to worry that there won’t be a design suitable for yourself! 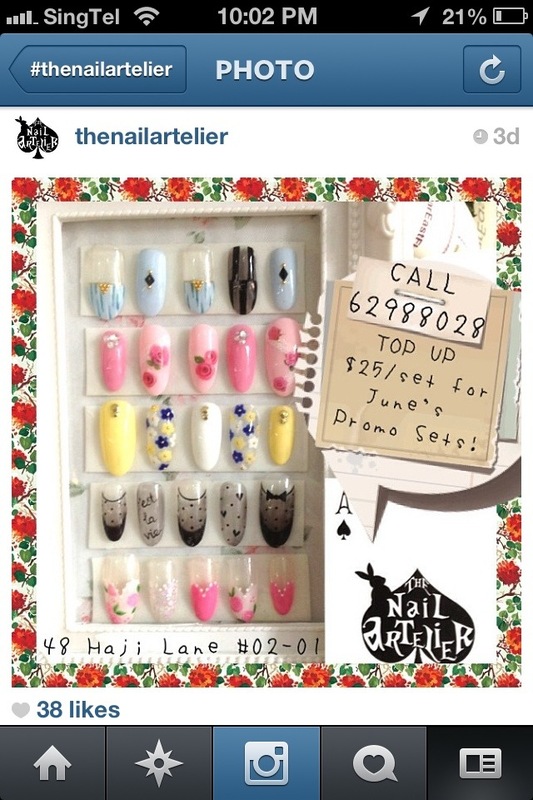 I grabbed this picture from our Instagram account that we posted, an overview of all the designs on promo for June! One of the more popular designs was the daisies set, and I did them in different color variations over the past few days. Some were done with nail polish, and some with gel polish, with slight variations to the original set we posted. 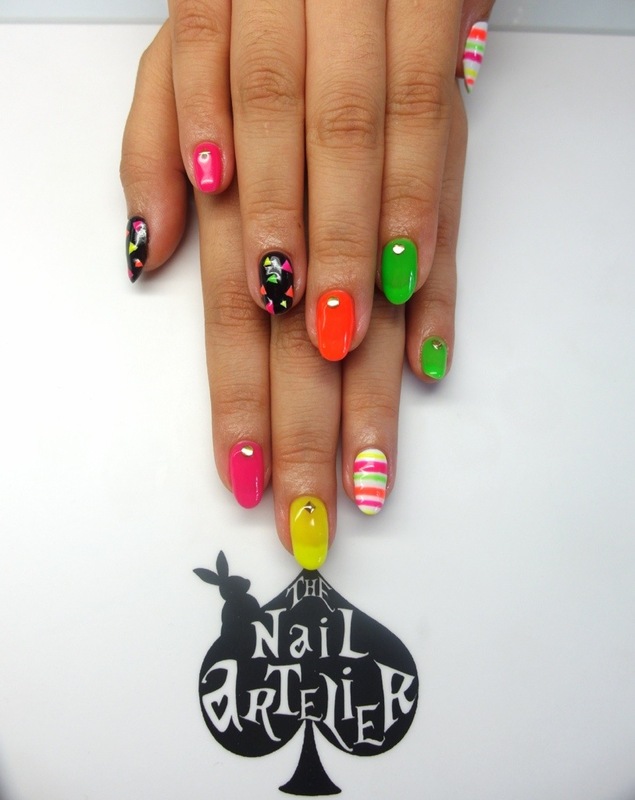 Today’s design is something that I love personally, and I’m wearing a modified version right now on my own nails. I omitted the cross and switched it to the black embellished nail. The original design was actually shown to me by the customer (whom I JUST found out is actually Jae Liew, the female lead in Michelle Chong’s upcoming movie Three Peas In A Pod! OMG!! What an honour!) and taken from a Japanese nail magazine. Here it is! 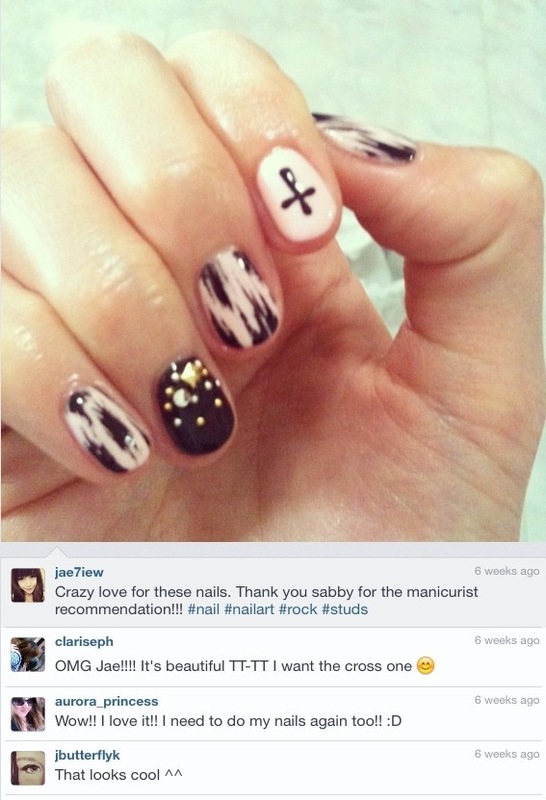 Jae has beautiful nail beds that are long and narrow, so she doesn’t need to keep her nails long. And here’s a screen grab from her Instagram! And an express pedi design that she requested for! Thanks to my regular customer Sabrina for the recommendation to Jae!